The above map is a map of the different types of property in the area. Each color identifies a different type of property. We grouped similar types of properties together to make the map easier to read so the restaurant type covers all small restaurants, bars, and franchise restaurants. This map can show you the diversity of the area with a strong emphasis on residential properties shown in a faded green. 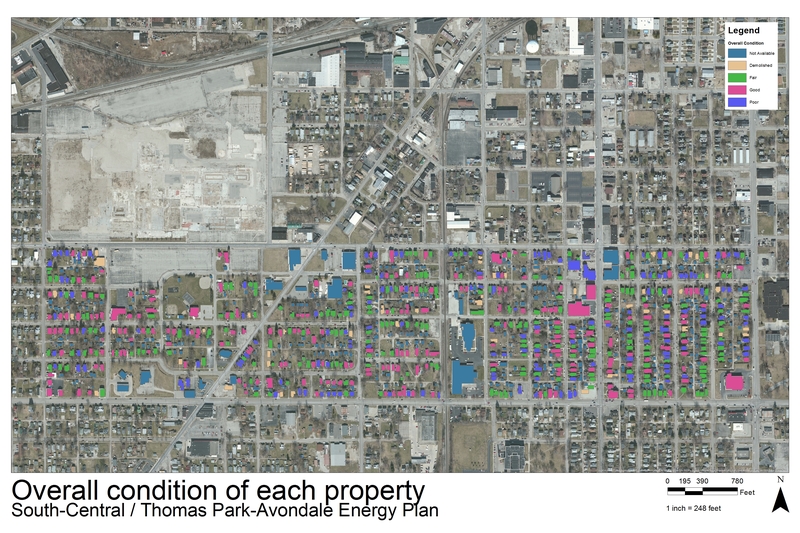 The above map shows the total assessed values of area’s properties in ranges of 25,000 dollars. There are several properties valued well over 400,000 with most of the properties in the 10,000 to 25,000 with some below that. 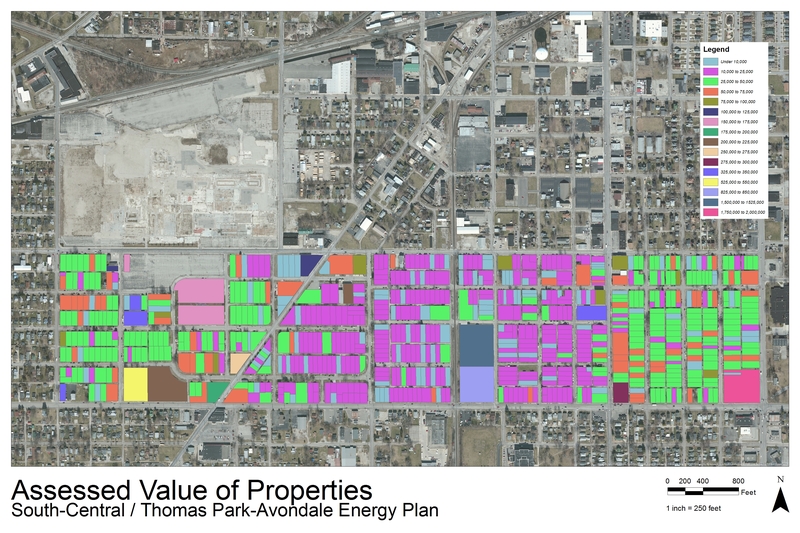 This map also shows the diversity of property values that goes with the area’s diversity of different uses for each property. 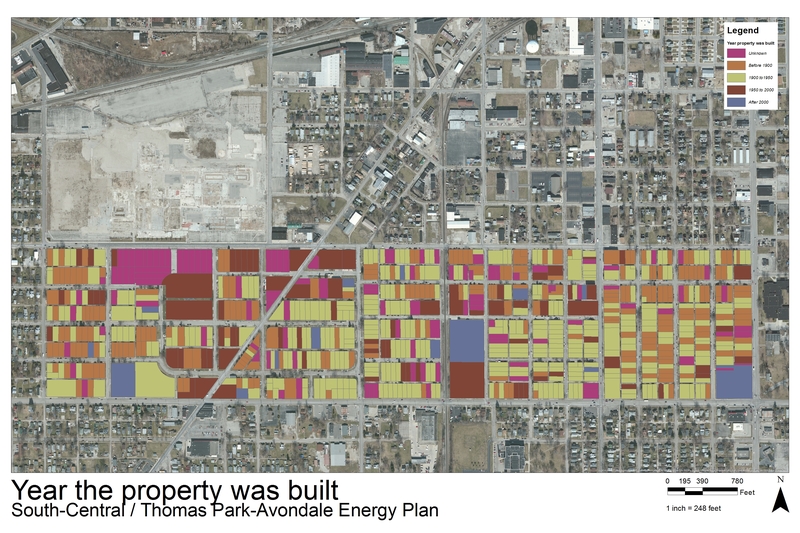 This map can go a long way in explain the diversity of assessed values for the property because it shows the overall conditions of each property on a scale of good to poor with a classification for properties that the data was not available for and for properties that have been demolished. 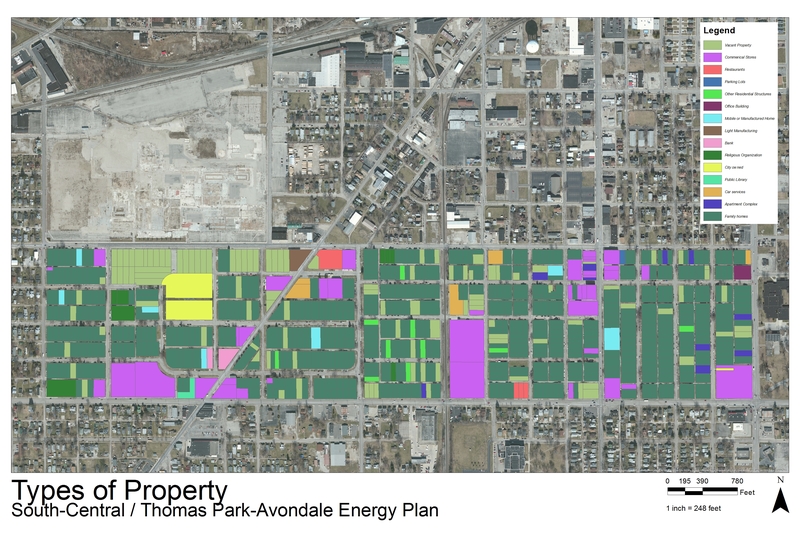 When you compare this map with the map of assessed values you find that many of the properties below 10,000 in value are areas with nothing built on them so the assessment is only measuring the land value. The map is meant to give a better understanding of the history behind the area’s homes. The map has the properties grouped by when they were constructed. As you can see most of the area has been here for a while with most of the homes being built before 1950 giving each a character that you do not see in newer homes. You see some new construction after 1950 but little after the year 2000. 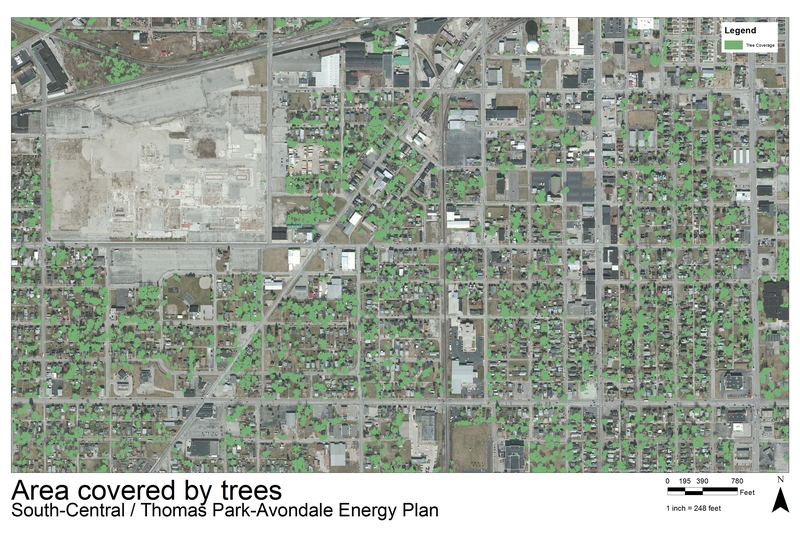 These two maps are used with our proposal for solar panels and how to finance them. The map on the top is the solar energy potential of the building roof tops. Red means that the roof gets a lot of solar energy making it ideal for solar panels that can cut down on your energy bill by making your power. 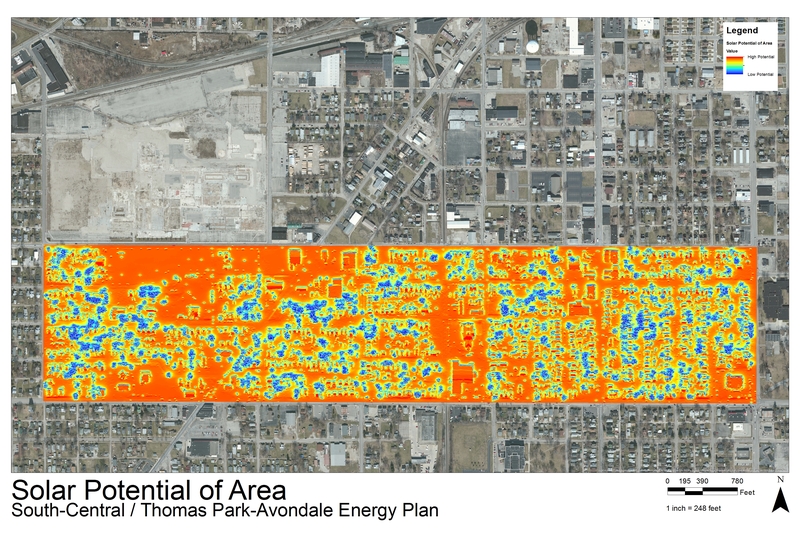 The map on the bottom is the solar potential for the total area and the trees do create areas that would be poor for solar energy so we would recommend any solar panels be on the roof. This map is simply a map of the area covered by trees currently in the area. This map is used to help create the solar maps seen above and can also be used to help create the passive solar effects described in our passive solar initiative. Tree coverage helps a lot to create shade and cool areas that cost zero energy to keep cool compared to an air conditioning unit.